A teenage actor who appears in the Harry Potter movies has been charged with growing cannabis plants. 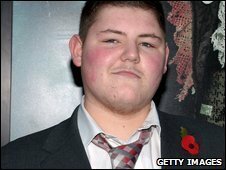 Jamie Waylett, 19, who plays bully Vincent Crabbe in the film series, allegedly grew 10 cannabis plants at his home in Kilburn, north London. He will appear at City of Westminster Magistrates' Court on 16 July. The world premiere of the next movie instalment - Harry Potter and the Half-Blood Prince - is taking place in Leicester Square on Tuesday. Mr Waylett was arrested in April. He has been in all the Harry Potter films as the right-hand man to character Draco Malfoy. Mr Waylett will appear in court alongside John Innis, 20, from Barnet, north London, who was charged with possession of 11 bags of cannabis and a knife.